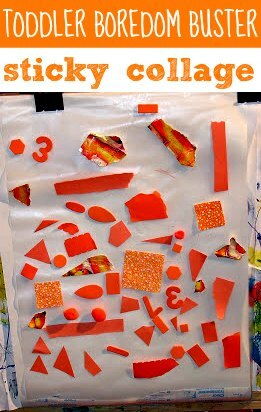 I love this sticky paper art activity as a quick go-to indoor activity for my son when he needs something to focus on. I love focusing on one color at a time and mixing things up with different textures, shapes and materials. He’s using his fine motor skills and getting a bit of sensory experience in there as well. 1. Attach a length of contact paper, sticky side out to an easel or wall. 2. Make available a large quantity of collage type materials: torn up papers, buttons, feathers, gems, poms, fabrics, etc. Since Kiddo is currently in a one-color-at-a-time phase, I extended the activity a bit by providing a box full of different colored materials and Kiddo sorted out all the orange items. When he was finished he liked pulling all the bits off and so the stick paper is waiting for the next time we need a quick boredom buster! Oh, we looooove contact paper here! We haven’t used any in awhile, either…I remember taping a large piece of it to the floor once and letting CJ walk on it barefoot- she LOVED it. Thanks for the reminder. I like your take at “one color at a time” not only does it help teach the color but it makes for such beautiful artwork. OH-MY-GOSH! what a fabulous idea. You are a genius. I will definitely have to try this with my 3.5 y.o ds. so we tried this…and it wasn’t as wildly popular as I’d hoped. Oh well. I posted pictures on my blog.